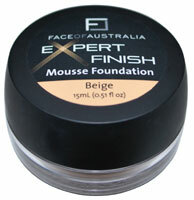 Experience a flawless complexion with the NEW Expert Finish Mousse Foundation from Face of Australia Colour Cosmetics. As the name suggests the foundation is of an air light mousse consistency and is glorious to put on. It gave a refined look to my skin, and I loved the even matt coverage, especially for the warmer Summer Months. The shades available cover skin tones from Ivory to Tanned Summer Skin, are easy to blend, and felt light and moisturising. At $12.95 it will become one of the mainstays in my makeup bag. The mousse is also very easy to get your hands on, stocked at Priceline, K-Mart, Big W and selected Pharmacies.